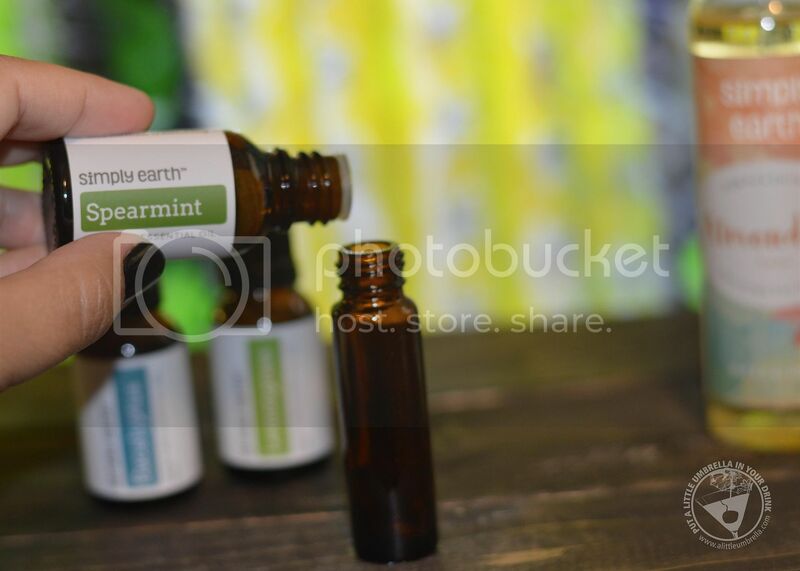 I am thrilled to be working with Simply Earth. This essential oil company is on a mission to make it easy, fun, and affordable to create a natural home using essential oils. 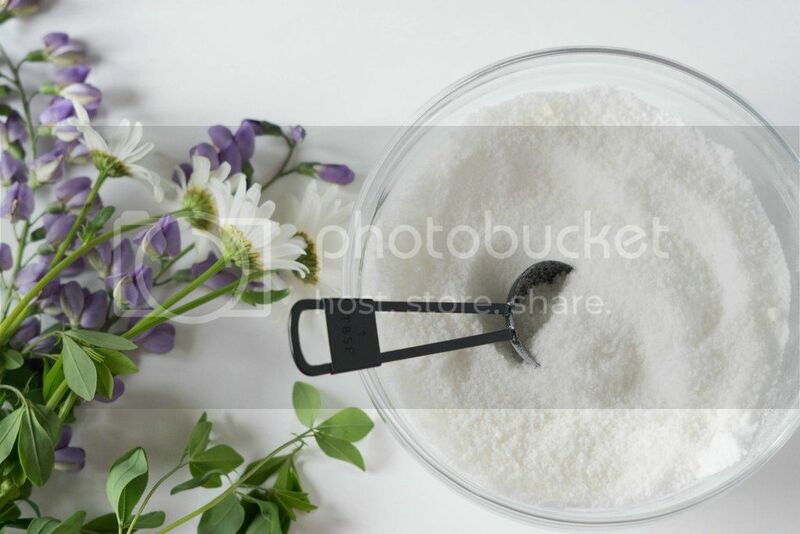 They make it easy by providing fun recipes to help you on your essential oil journey. This way, you will never get confused or overwhelmed by how or when to use them. The way that Simply Earth does this is via a themed monthly essential oil subscription box (you know how much I love subscription boxes)! Every month, you'll receive 4 full-size 100% pure essential oils. 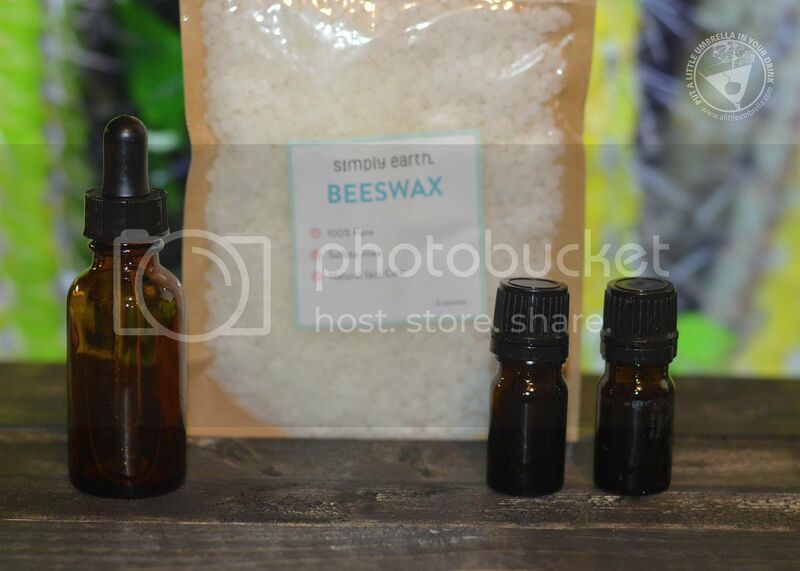 Each box also includes 5-6 easy to make essential oil recipes. 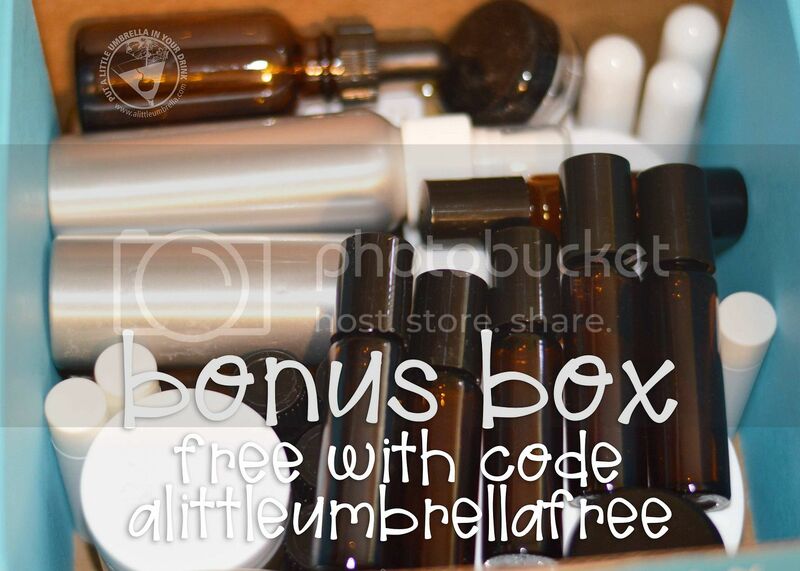 Once you subscribe with my code, ALITTLEUMBRELLAFREE, you will also receive a free big bonus box every six months. This box is packed with everything you need to create six month's worth of recipes (and then some)! The next three photos show what I received in my big bonus box. 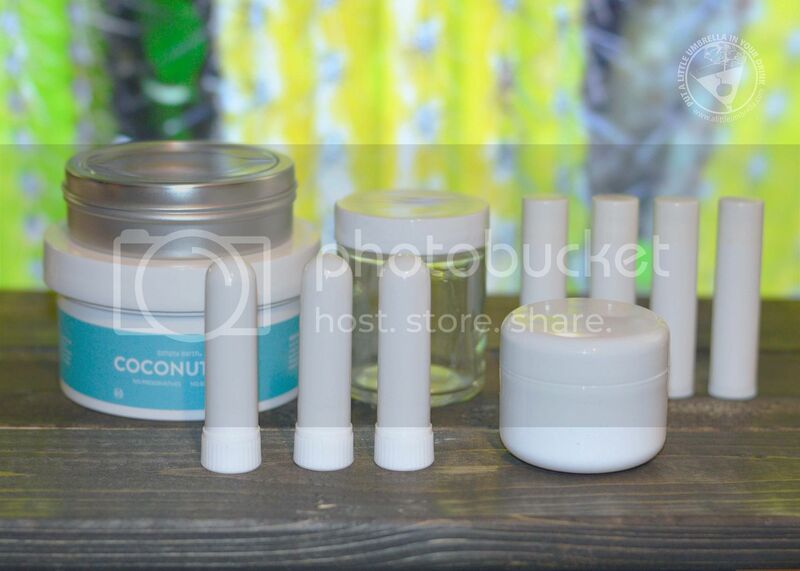 My big bonus box included almond oil, coconut oil, and beeswax, along with tons of containers, jars, rollerballs, spray bottles, lip balm tubes ... so much stuff! 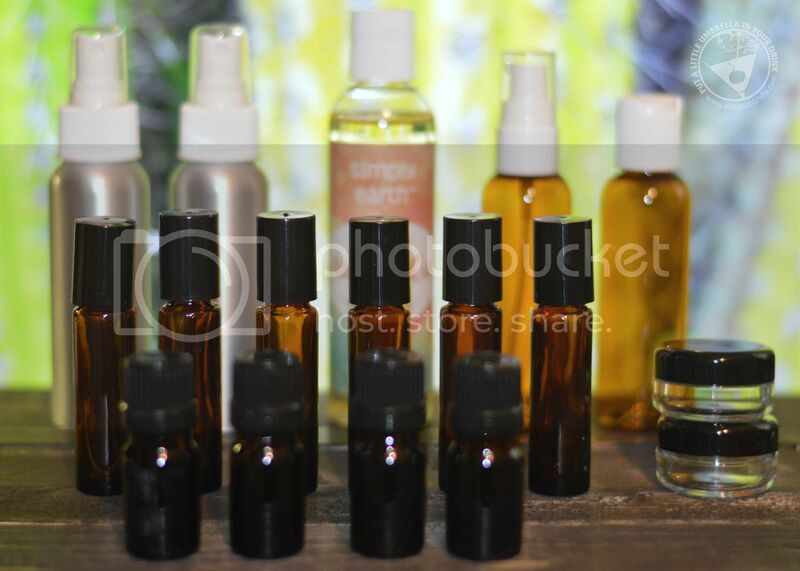 You can see how all of these goodies will assist you in creating your essential oil recipes! Now for the actual monthly recipe boxes. There is a new theme each month and the July theme is vacation. Why? Because summer is full of adventures, and whether you're headed somewhere new or your own backyard, this month's box can make your summer vacation more natural. 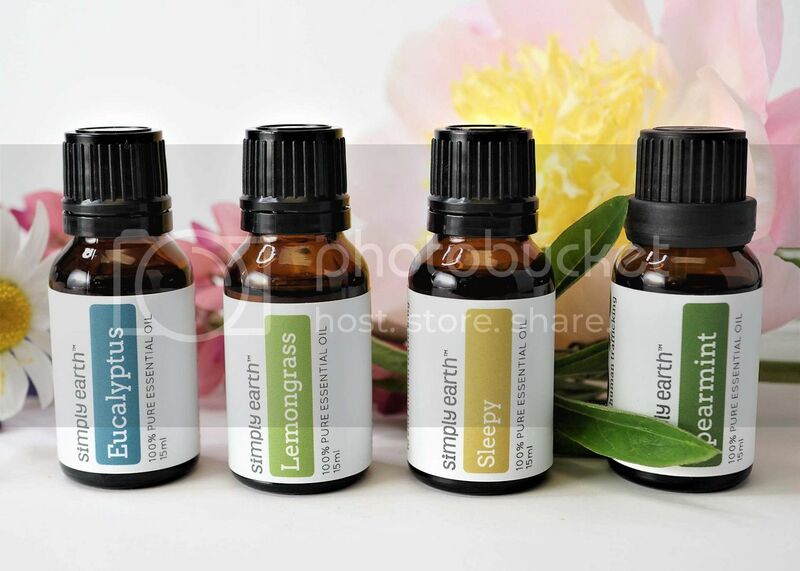 Use the included four essential oils (Eucalyptus, Lemongrass, Spearmint, Sleepy) to create six recipes! I used the almond oil + one rollerball from my big bonus box to create my first recipe. Are you seeing how this works now? 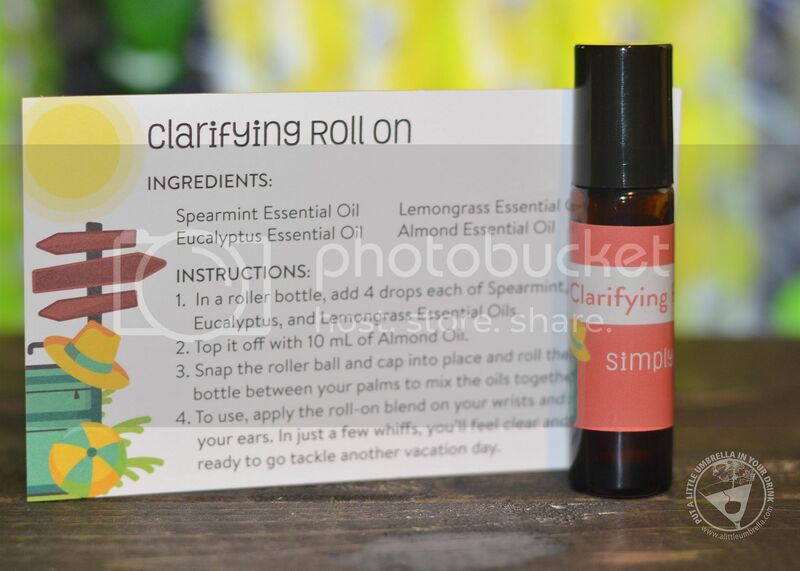 The Clarifying Roll-On can help you feel clear, clarified, and ready to enjoy your vacation. The recipe card instructs you on exactly how to create the roll on. There is even a sticker sheet included to label your bottle when you finish! 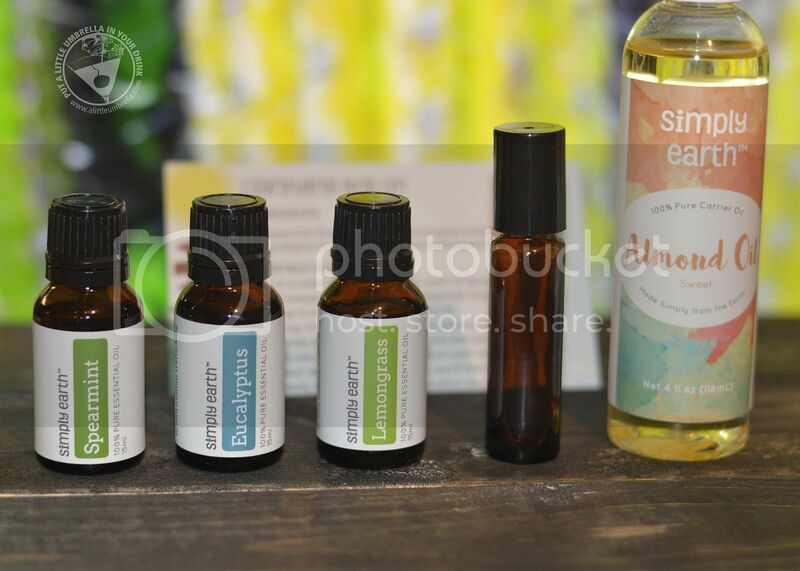 Now you have a new essential oil blend to add to your natural home toolbox! One of my favorite recipes from the July box has to be the sore muscle soak! 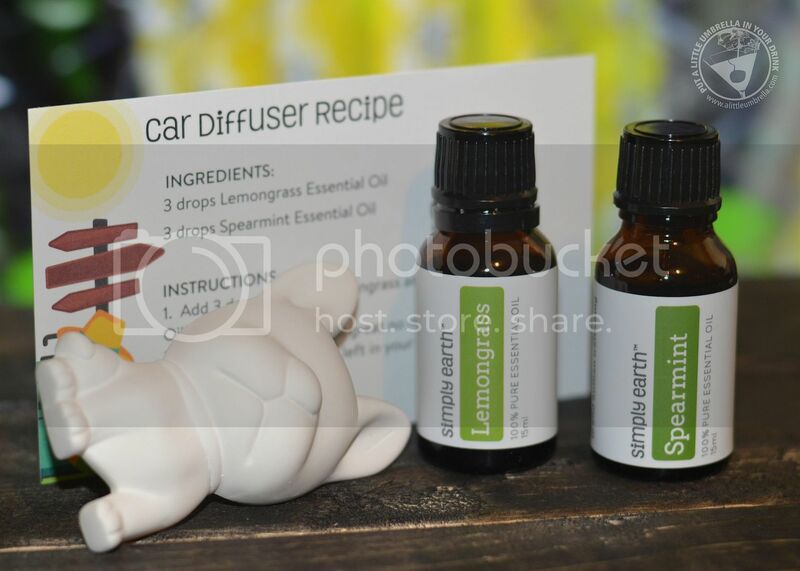 You will use the sleepy and lemongrass oils plus epsom salt and baking soda to create this recipe. Your aching joints and muscles will melt away as you relax, now that is what I call a vacation! This month's box even included an adorable car diffuser. This pup is so cute and will keep my car smelling fresh all summer long! You can use any of the full-sized oils in any way you choose of course. No need to follow the recipes if they don't appeal to you. 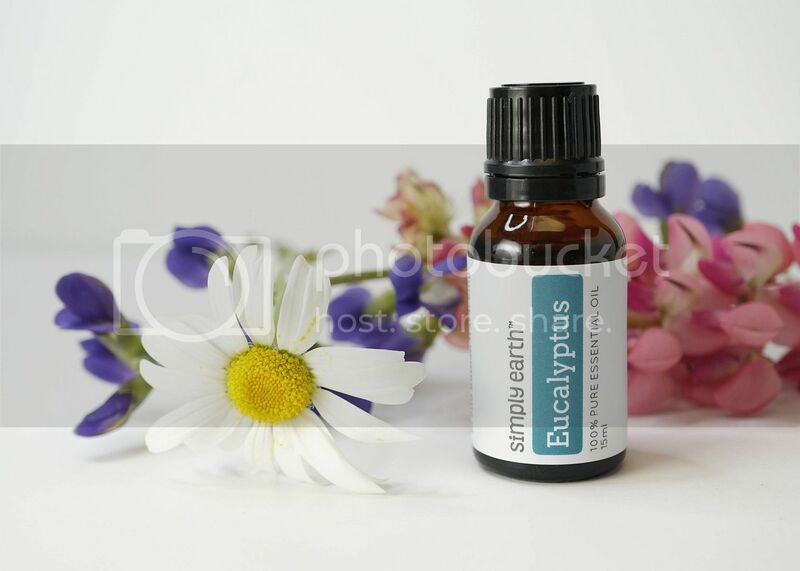 For example, I love using eucalyptus essential oil on its own to improve my mental focus or clear congestion. A monthly Simply Earth box does not require a long-term commitment. 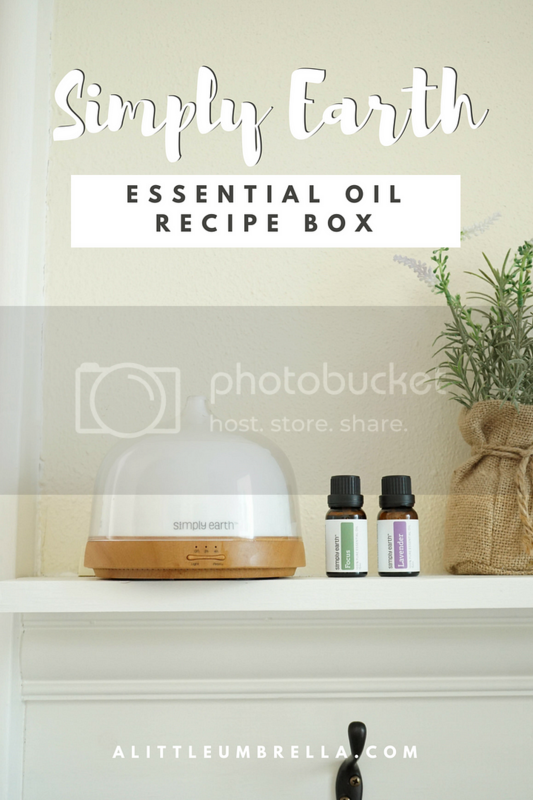 For just $39 a month, receive an essential oil box valued at $150 or more. 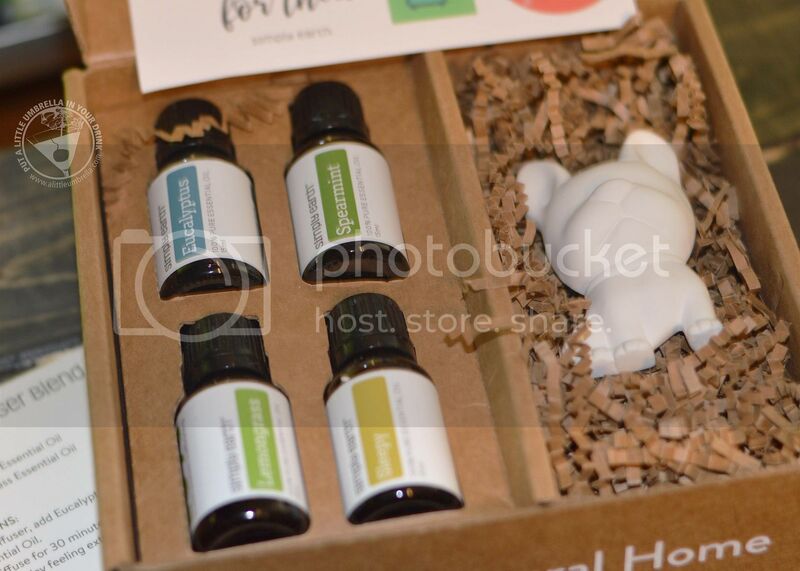 Each themed box includes 4 Essential Oils + Fun Extras and it ships free! You can cancel anytime. Don't forget to also use my code ALITTLEUMBRELLAFREE to receive a Big Bonus Box worth over $50 when you start your subscription.